This post first appeared on Oct. 23, 2007. I’ve noticed that effective writers tend to share seven traits. 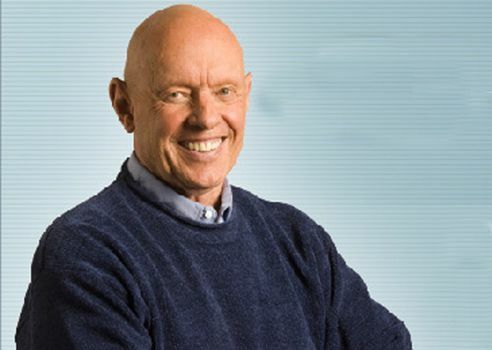 So, with apologies to Stephen Covey (pictured above), here is my own list of 7 habits worth adopting. 1) Separate the writing and the editing processes. When they write, they write, without worrying about the quality of their work. Writer/director Cecil Castellucci says: “The best flowers are fertilized by crap.” Remember this and give yourself permission to write a really crummy first draft. Editing is a job for later. That’s when you’ll have plenty of time to rearrange big chunks of text, monkey around with sentence structure, obsess over word choice and fix punctuation. 2) Focus on the interesting. Effective writers (and speakers) always tell lots of stories. If they have to communicate something “theoretical,” they illustrate it with real life examples and anecdotes. They know that human beings don’t just crave food — they are also starved for stories. 4) Do adequate research. There is nothing more painful than trying to write when you have nothing to say. Effective writers understand that good research is all about asking interesting questions — of themselves, of the books, websites and reports they read and of anyone they interview. And this needs to be completed before any writing can begin. 5) Learn from the writing of others. Effective writers understand that they are lifelong apprentices. They learn by reading — constantly. Note: this is not just passive, flip- through-a-thriller-while-sitting-on-the-pool- deck kind of reading. This is active sit-up- and-pay-attention-to-technique dissection — similar to what a scientist would do in a lab. You won’t want to read this closely all the time, of course (it’s work — although fun work, to my mind). But effective writers do some of this every week. 7) Read their work out loud. Language isn’t just meaning — it’s also music. The most effective writers can often be found sitting by the computer keyboards, madly whispering to the screen, repeating their words back to themselves. Yes, it looks kooky and coworkers may become alarmed. But effective writers don’t care. They do it because it works. Follow these 7 habits and watch your writing improve dramatically. What’s your most effective writing habit? We can all learn from each other so, please, share your thoughts with my readers and me in the “comments” section below. Anyone who comments on today’s post (or any others) by August 31/16 will be put in a draw for a copy of So You Think You Know English by Gordon Osmond. Please, scroll down to the comments, directly underneath the “related posts” links, below. Note that you don’t have to join the commenting software to post. See here to learn how to post as a guest.